AppShopper Updated: Here at TNN, its our job to test apps and give you our opinion. With the iPad still the tablet of choice, its fitting we profile the Free iPad App of the Week. 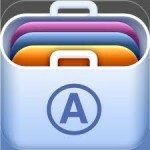 Recently updated, the AppShopper suits the title, Free iPad App of the Week. First of all its free, well it’ll cost you the time to select and download, and its worth abundantly more than the time spent. The AppShopper does many things for you, top of the list, it saves you time. A user friendly app that allows you to select specific criteria of the left, and on the right side the selections are listed. Wonderfully designed it looks great on the iPad in landscape mode. The selections can be very specific, ranges include Popular, ‘Top 200’, What’s New or you can Search. Also choosing the Price, Type (meaning Updates, New or Price Drops), Device and Category are ways to narrow your search. After narrowing down the selection of your tailored search just touch free and the app will download. What makes the AppShopper different from the AppStore itself is the easy to navigate screen, its not as busy and overloaded with information as the AppStore. 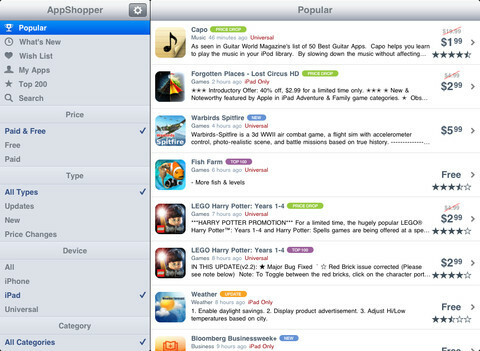 The AppShopper is actually your own tailor-made app store.